Now you can play your tunes in your car through any MP3 player, computer, or laptop to listen to your favorite tunes through any FM stereo receiver. The Belkin TuneCast 3 connects portable music players to your car or home stereo quickly and easily over FM radio waves. It lacks some of the features of its predecessor, but the TuneCast 3 has improved on sound quality, signal strength and ease of use, making it one of the better FM transmitters we've reviewed. The other reviewers are right. In major cities you'll have trouble finding a channel clear enough to work. Search for "Belkin" and "my best FM stations" and you'll find a tool that'll tell you the clearest channels in your zip code. That may save you time. This trasmitter is not suitable for big cities, as it difficult to find the frequency where nothing is broadcasted. Also the unit is very sensitive to location in the car - takes some time to find the perfect place for transmitter. Every thing works great on this, all except the brodcast distance witch could leed to greater chance of interferance, but not bad at all. I know most of the reviews are pretty negative but it works half-decently for me. I drive a 2005 Ford Focus with the standard Ford issued radio. Since I don't drive on a daily basis, I did not want to spend the big bucks for a state-of-the-art car radio. 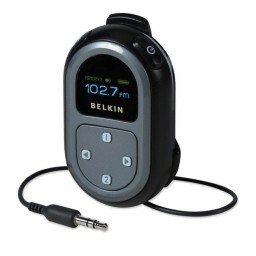 I've had a Belkin TuneCast II, the other model universal FM transmitter. But, this one works much better. The battery life seems to be at least 3 times longer. Also, most importantly, this model does not shut off after a few seconds. It stays on about 10 minutes. Sorry to say not real impressed with this tuner. Hooked it up to an Ipod in my vehicle and had to keep changing channels to try to get clear sound, keep getting alot of static. They have dumped a lot of transmission power out of these. If you are not close, try to find an older one of the same model. Outherwisw it functions great. Excellent product. It is a definite improvement over previous versions of the Tunecast, which I have owned and used. I was amazed at the quality of the sound. It has excellent bass response as well as excellent treble response. Changing the frequency was simple to do on the go. Belkin Tunecast III FM Transmitter is just junk, would not tune to channel, static not worth it unless you do the attenuator modification. The modification makes all the difference, clear static free audio. Pros: You can use batteries or plug it into the car. The screen, preset buttons, headphone jack, etc. - the entire product works. Additionally, it has been durable. I've had it for roughly two years and it still works as well as the day I first got it.